A steady soaking rain will develop this afternoon, continuing through the overnight hours before tapering off from southwest to northeast between 3AM and 9AM on Monday. The image below shows widespread rainfall (image loop below from 10AM through 3AM) during the afternoon hours today with pockets of moderate to at times heavy rain, especially in locations along and east of the interstate 95 corridor. 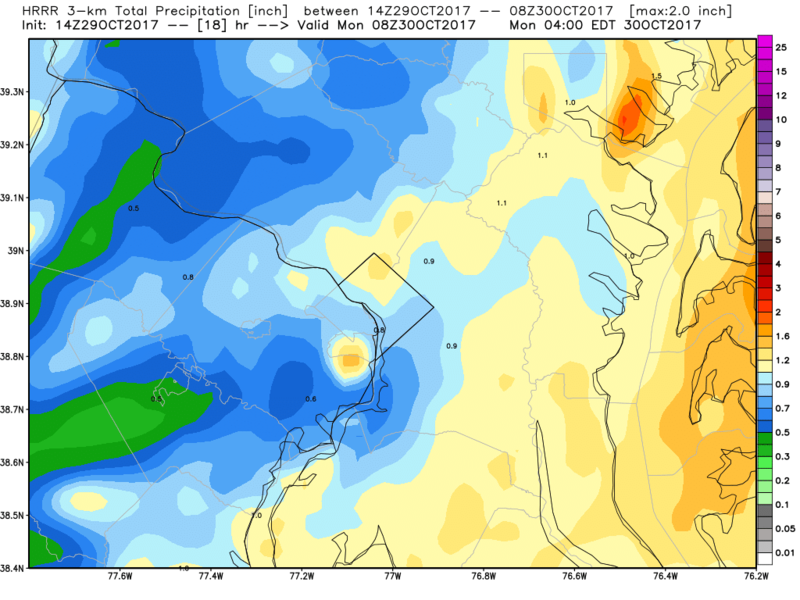 Rainfall amounts of one to two inches of rain is likely with some locations across central and southern Maryland possibly picking up as much as three inches of rain before the coastal storm pulls away from our area on Monday morning. Sustained winds of 20 to 30 mph can be expected throughout the evening and overnight hours with occasional gusts between 45 and 55 mph. Temperatures will fall throughout the day today into the 40s this evening with wind chills dropping into the 30s overnight. Dress accordingly on Monday.